What is America&apos;s most dangerous city? September 15, 2014, 1:19 p.m. Compared to most of the developed world, the United States has an unusually high violent crime rate. Nevertheless, over the past twenty years the US has seen a huge drop in crime. Most violent crime rates, including for murder, have halved in the past twenty years. Much of this improvement has taken place in America&apos;s cities. How dangerous each city is still differs significantly according to which city, exactly, we are talking about. Out of America&apos;s ten largest cities, the murder rate in its safest city (New York) is less than a quarter of the murder rate in its most dangerous large city (Philadelphia), with 5.1 murders per 100,000 compared to 21.5. The latest research from YouGov shows that according to the public America&apos;s three largest cities are also its most dangerous. Chicago, the third most populous metro area in the country, is seen as the most dangerous, with 53% of Americans saying that the city is &apos;unsafe&apos; while only 33% say it is &apos;safe&apos;. New York City is the seen the second most dangerous, followed by LA and DC. Texas&apos; two largest cities, Dallas and Houston, are seen as being safest. Attitudes towards how dangerous each city is generally do not differ significantly according to whether or not someone has visited the city. This is not true for New York City, however, where people who have been there tend to say that it is &apos;safe&apos; (49%) rather than &apos;unsafe&apos; (46%). People who have not been there widely say that it is &apos;unsafe&apos; (58%) rather than &apos;safe&apos; (30%). Crime has plummeted across the country over the past twenty years, but New York City has seen a particularly dramatic drop in the crime rate. In 1993, there were 2,420 murders in the city, compared to 333 in 2013. Most Americans, however, don&apos;t recognize that violent crime has dropped so significantly over the past twenty years. Over that time frame the national murder rate has halved, along with non-lethal violent crime, yet half the country (50%) say that violent crime has increased since 1994, and only 22% know that it has decreased. 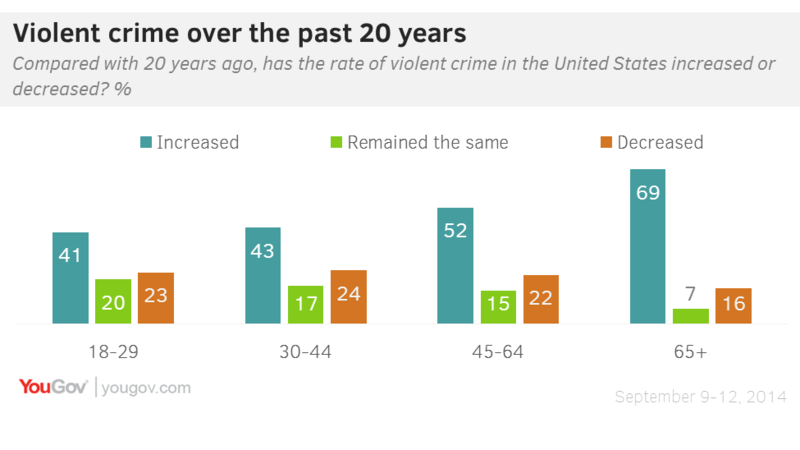 Younger Americans are less likely to say that crime has increased since the mid-90s, while people with a household income of over $80,000 are the only group that tends to know that violent crime has dropped.